If you read part one of this blog series, you already know that wearing quality sunscreen, not using a tanning bed, and covering up with hats and lightweight clothing when you go outside can help prevent you from developing sun spots on your skin. While protecting your skin from sun damage is one of the most effective things you can do to avoid age spots, wrinkles, and sagging skin, there are other measures you can take to help prevent these signs of aging. Continue reading to learn more, and contact Kallgren Dermatology Clinic or visit us in Boulder, CO, today to schedule an appointment! You’ve probably heard the phrase, “You are what you eat,” and in a way, the same goes for your skin. Your skin is the largest organ in your body and it requires proper care to maintain optimal health and hydration. This is especially true for residents of Boulder, Lafayette, Louisville, and other nearby areas, as our high elevation, sunny days, and harsh winters can be taxing on your skin, leading it to dry out, crack, and burn easily. That being said, investing in high-quality skin care products is essential to keep your skin moisturized and protected against our dry climate, and moisturizers without added perfumes and other irritants are your best friend here in Colorado. Moisturizers and high-quality sunscreen are great skincare products to have on hand if you want to avoid developing sun spots and wrinkles from dry, damaged, and aging skin. Oil-based moisturizers and gentle anti-aging serums are great during the winter, due to the deep-penetrating hydration that helps your skin remain soft and supple when temperatures sink below freezing. So, if you start to notice your skin getting dry and itchy during the winter, or that more sun spots are showing up, take that as a sign that your skin is dehydrated, potentially sunburned, and in need of extra nourishment. Speaking of giving your skin the nutrients and hydration it needs to keep sun spots and wrinkles at bay, another thing you can do to fight skin discoloration is eat healthy foods and drink lots of fluids. 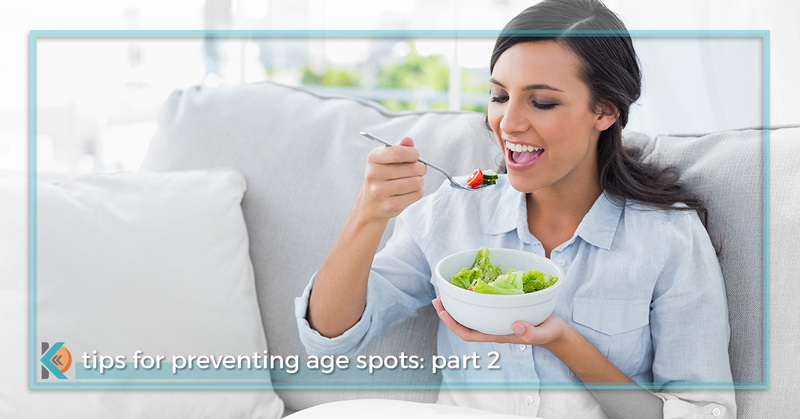 As it turns out, what you put in your body has a huge impact on your skin health — junk food can make your skin oily and result in acne, while fruits, vegetables, and healthy fats can help you maintain that youthful glow. This is not to say that you can never eat chips and cookies if you want to avoid getting age spots and saggy skin, however, taking care of your body and feeding it a well-rounded diet is one of the best things you can do for all of your organs, including your skin. Now that you have some tips and tricks for preventing age spots, it’s time to take matters into your own hands and give your skin what it needs during each of the four seasons. Contact us today or visit Kallgren Dermatology Clinic in Boulder today to check out our anti-aging serums, moisturizers, sunscreens, and more!